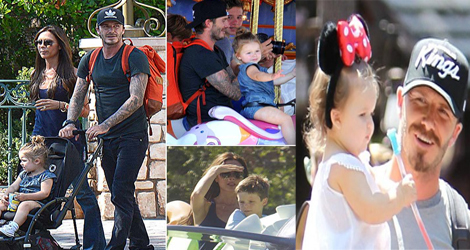 David Beckham and his family were spotted visiting Disneyland California on Monday – and the pictures were really cute. The whole family made it to Anaheim in California, and they seemed to enjoy the terrific summer weather. The youngest Beckham, four-year-old Harper, appeared to spend most of her day in a stroller, but looked to have plenty of fun nonetheless. Despite this being a family trip, Victoria was, as always, keen to look her best for the paparazzi and was dressed in black skinny jeans and a sleeveless top. She also donned a white hat. The eldest Beckham, 16-year-old Brooklyn, was in celebratory mood after passing his GCSE exams last week – something he announced on Instagram. Gordon Ramsay and his family – wife Tana and daughters Megan, Holly and Tilly – also joined the Beckham clan for their exciting day out. The day looked to be a tiring one for both families, but the children especially seemed keen to sample all the rides that Disneyland had to offer. Former England footballer, Beckham, retired from professional football in 2013 after a 20-year-career.